Margaret Hasse, Poet, writes in a voice described by Naomi Shihab Nye as “potent, clear-cut, honest – no posturing, no distractions. All heart and soul and care.” You can read her books in your book club or by yourself, attend her readings, join her poetry classes, use her manuscript critique service, collaborate on a project, or surprise her. Margaret Hasse, Consultant, is a multi-faceted consultant working in the Twin Cities of Minnesota and around the country. She has a 25-year track record in strategic planning, fundraising and grant writing, facilitating effective meetings, and evaluating. She also edits poetry manuscripts and facilitates writing workshops. 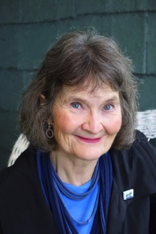 Margaret Hasse was honored to be selected to present her work at the annual Pankake Poetry Reading sponsored by the University of Minnesota libraries. The event, which took place at the Anderson Library on April 11, 2018 and drew 150 people, is named for Marcia Pankake, a former librarian who fostered poetry programming on campus. Hasse created a unique retrospective by showing cover images and reading poems from each of her five poetry collections. To coincide with the reading, Nodin Press reissued her first book, Stars Above, Stars Below, with some new features. Here are photos and the video of the event. Between Us won the Midwest Independent Publishers Association (MIPA) prize for the best book of poetry puzblished in thze region in 2017. Margaret's extensive archive is now a part of the University of Minnesota Library's Upper Midwest Literary Archives, here.